If you are looking for information on the Relax The Back franchise business opportunity, Relax The Back franchises or Relax The Back franchising, then you have come to the right place. Proven Business Model. An Industry Ripe For Success. For over 20 years, Relax The Back has been the nation's leading specialty retailer of ergonomic and comfort products. For entrepreneurs, that fact alone is exciting. But when you consider that we are the only franchised retail business of our kind within the US$70 billion health and wellness industry, that seals the deal. The trends are clear. There are 76 million Baby Boomers searching for solutions to lead healthier lifestyles, and the need for our quality back and neck care products has never been greater. 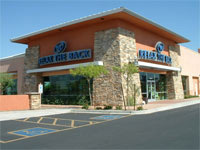 When you become a Relax The Back franchisee, you join a time-tested support system. You're in business for yourself, but you're not alone. From robust start-up support and powerful marketing and advertising expertise to ongoing business consulting, we position all of our franchise owners for success. More than half of our franchisees own multiple stores - a true testament to our solid business model and robust support system. It's time to take your next step to a healthier future. Relax The Back will take you there. "I love this business! We got into it eleven years ago and have received great support and advice from both corporate staff and other franchisees on challenges ranging from personnel to accounting to advertising to you-name-it. Our clients love us and our demographic appeal is powerful!"